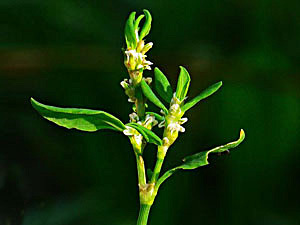 Knotweed is a safe and effective astringent and diuretic herb that is used mainly in the treatment of complaints such as dysentery and haemorrhoids. It is also taken in the treatment of pulmonary complaints because the silicic acid it contains strengthens connective tissue in the lungs. The whole plant is anthelmintic, astringent, cardiotonic, cholagogue, diuretic, febrifuge, haemostatic, lithontripic and vulnerary. It was formerly widely used as an astringent both internally and externally in the treatment of wounds, bleeding, piles and diarrhoea. Its diuretic properties make it useful in removing stones. An alcohol-based preparation has been used with success to treat varicose veins of recent origin. The plant is harvested in the summer and early autumn and is dried for later use. The leaves are anthelmintic, diuretic and emollient. The whole plant is anthelmintic, antiphlogistic and diuretic. The juice of the plant is weakly diuretic, expectorant and vasoconstrictor. Applied externally, it is an excellent remedy to stay bleeding of the nose and to treat sores. The seeds are emetic and purgative. Recent research has shown that the plant is a useful medicine for bacterial dysentery. Of 108 people with this disease, 104 recovered within 5 days when treated internally with a paste of knotweed. Waste places, roadsides, railway embankments and the coast. A common garden weed. Young leaves and plants - raw or cooked. Used as a potherb, they are very rich in zinc. A nutritional analysis is available. Seed - raw or cooked. Rather small and fiddly to utilize, they can be used in all the ways that buckwheat (Fagopyrum esculentum) is used, either whole or dried and ground into a powder for use in pancakes, biscuits and pi�ole. The leaves are a tea substitute. Yields a blue dye that is not much inferior to indigo. The part used is not specified, but it is likely to be the leaves. Yellow and green dyes are obtained from the whole plant. The roots contain tannins, but the quantity was not given. Seed - sow spring in a cold frame. Germination is usually free and easy. When they are large enough to handle, prick the seedlings out into individual pots and plant them out in the summer if they have reached sufficient size. If not, overwinter them in a cold frame and plant them out the following spring after the last expected frosts. Division in spring or autumn. Very easy, larger divisions can be planted out direct into their permanent positions. We have found that it is better to pot up the smaller divisions and grow them on in light shade in a cold frame until they are well established before planting them out in late spring or early summer. Although no specific mention has been made for this species, there have been reports that some members of this genus can cause photosensitivity in susceptible people. 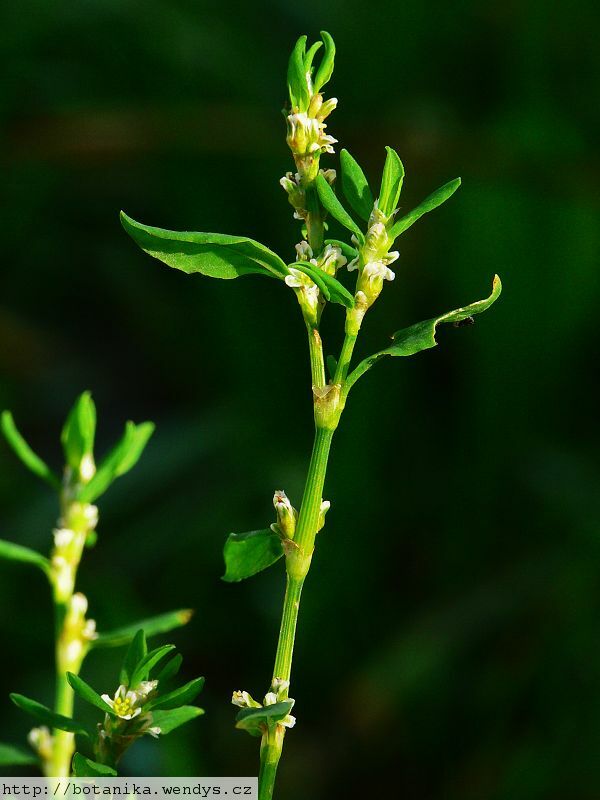 Many species also contain oxalic acid (the distinctive lemony flavour of sorrel) - whilst not toxic this substance can bind up other minerals making them unavailable to the body and leading to mineral deficiency. Having said that, a number of common foods such as sorrel and rhubarb contain oxalic acid and the leaves of most members of this genus are nutritious and beneficial to eat in moderate quantities. Cooking the leaves will reduce their content of oxalic acid. People with a tendency to rheumatism, arthritis, gout, kidney stones or hyperacidity should take especial caution if including this plant in their diet since it can aggravate their condition.